What are the Programming Modes? 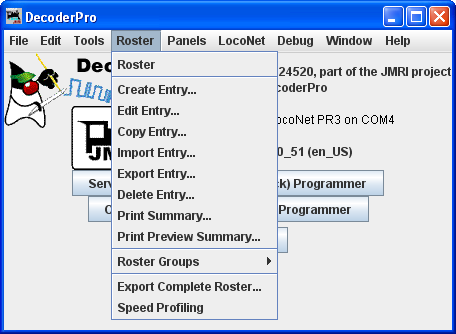 The first action in programming a locomotive with DecoderPro® is to fill out the roster entry screen. Most of these fields are self-explanatory. However, note that the first field (ID) becomes the file name in the Roster for the locomotive you are programming. Set up a schema to identify your locomotive to its decoder program. i.e. Manufacturer, Loco Type, and Address (e.g. Kato_SD40-2_5645). Spaces in the ID field will be changed to underscores (_) when the file is written. In a club environment, often the ID begins with the owner's name, or member number. This way the Roster (which is sorted alphabetically) will keep all of an owner's locomotives listed together. The Decoder Comment field is a good place to add the date you purchased the locomotive, price, or any other information you might feel is important to record. The [Save to Roster] button stores the current decoder information to your computer hard drive and folder where your roster file is located. The default storage is the same directory where the program is installed. The [Reset to Defaults] button can be used to return the Roster file to the condition of a new file for the type and version of the decoder listed in the roster entry. It does NOT change the values in the roster file on your hard disk, unless you specifically save it after using this reset button. It also is not written to the decoder until you specifically select a write operation. 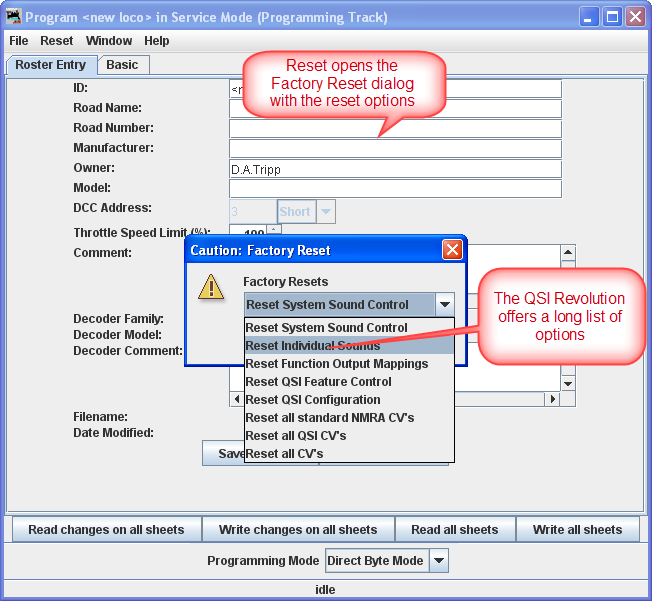 It was included in DecoderPro so that if you get hopelessly confused in proceeding screen to screen entering variables, you can return to the manufacturers baseline default set and start again. Most decoders will activate the Reset Menu (next to the File menu at the top of the page). This will reset the decoder to the manufacturers default settings for all the CVs, or just some of them if the manufacturer has several reset routines. It does this by writing directly to a CV in the decoder, if the decoder has that feature, CV8 in the case of Digitrax. All decoders may not support reset and how they work is manufacturer and decoder dependent. You will note that the decoder address is shown but grayed out (or blank if this is a new locomotive in the roster). This field is automatically filled in by the program and is determined from the address entered using the Basic tab which we will get to shortly. This address is used with the Ident function on the start page if you wish to recall a locomotive that is already in your roster. The Programming mode can be changed by selecting mode from drop-down list at the bottom of the window. To the left of the Drop-down list is the current programming mode that is selected. There are several programming modes. JMRI now selects the best mode for you. It determines this from the command station type you are using and the decoder model you are attempting to program. Usually this will be OK. If you find that you are having a problem with programming you may try a different mode. For most newer decoders, stay with Paged mode or whichever Direct mode your Command Station supports. Your decoder documentation should let you know if programming in some other mode is necessary... but if you are having problems, experiment. 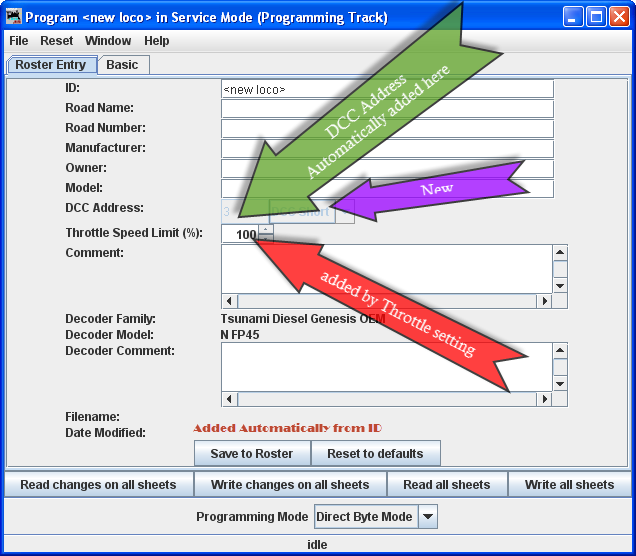 If a mode is not supported for the selected decoder and system, that option will be grayed out. When you make your selection, the programming mode should now display to the left of the drop-down list. 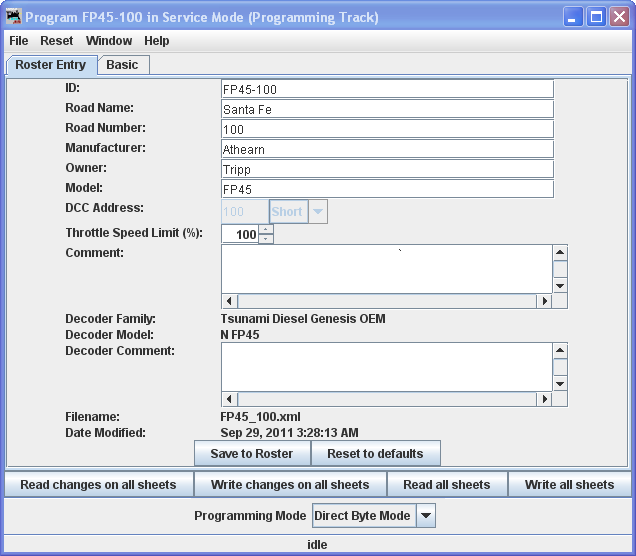 Basic Programming Roster setup for Athearn FP45 n scale with Digitrax Tsunami Diesel Genesis OEM decoder. Now that we have the Roster information all in order, we can continue with programming the decoder. Let's move on to the Basic Programmer.